Boo. In true October spirit I'm going to frighten you all away by talking about Christmas today! I'm one of those Christmas lovers who can talk about the holiday on any given month. I'm the one who feels happy when I see Christmas decorations at the stores right now. I have a SIMPLE yet EFFECTIVE secret that will make your Christmas holidays a breeze. 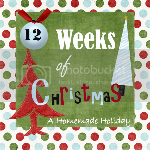 I'm sharing the idea in October so you can actually enjoy December: A CHRISTMAS FOLDER. 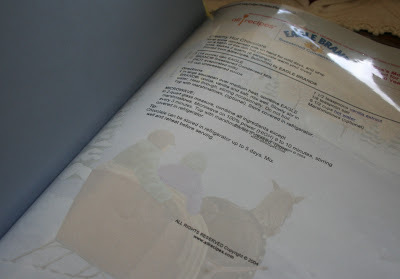 I have kept a Christmas folder ever since I was 14 years old! See, the photo below are pages of my archives of gifts I've bought through the years. We all have a never ending TO DO list in December. In this section I keep a master list, a weekly list, and a daily list. You can also print off a December calendar page to slip in there to keep track of events. Trust me, you won't forget any details if you make these lists! 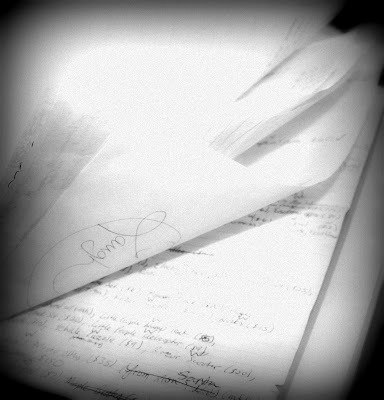 Here I store my archives of lists for all gifts given and received in the past. It works as a great tool for budgeting and comparing what we spend from year to year. I also keep a current year's list of what we're giving, and a box to check off once it's been wrapped. This list serves to show me what "STATUS" each gift is at: in the mail, needs to be ordered, needs wrapped, etc. I also keep my Christmas card list here. I keep the pages of this last section in clear avery pockets to protect the pages from food. It contains all my favorite holiday recipes and my master meal plans that I've used for Holiday Meals throughout the years. This really assists in keeping food traditions. I also keep a master list of our favorite holiday cookies here. 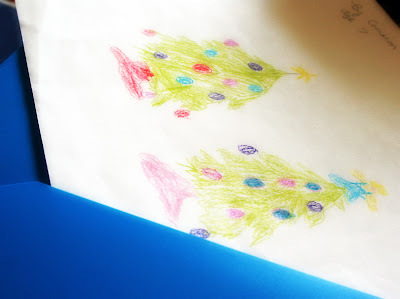 A fun detail is to print your recipes on Christmas paper like shown below. Notice the clear plastic sleeves and the holiday paper. You can double click the photo for a better view. I even keep some fun info in here like napkin folding "how to's" and different notes on what worked for the Christmas meals and what didn't work. PS... Slid into the pocket of my Christmas folder is some artwork Skyler made for me a couple Decembers ago...and of course, it always makes my heart smile every year when I pull it out. it really will work for you! sprinkle some peace into your December. 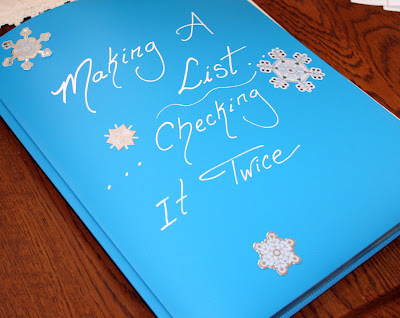 Click on the button below for more holiday lists. 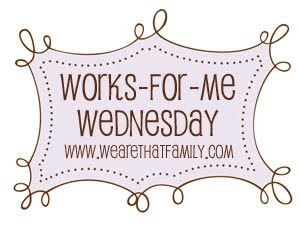 For More Works for Me Wednesday Ideas click on the button below. You mean to tell me that all I had to do was find that folder and I could have seen what mt gifts were? Wow, you better keep it hidden this year! I love how organized you are. Maybe you don't realize it, but it has really helped make my holidays better too. Let me be the first to wish you a Merry Christmas! I loved this post! I love being organzed and have been wanting to do a Christmas binder for awhile now! Not sure if I'll start one this year but I will sooner or later! xoxox. Ahhh, Lisa. This is AWESOME! This is just the sort of thing I would love to spend hours/days/weeks/months working on and then never actually use it for its intended purpose. I am sure this will help many many people who can follow through with stuff. Ooh, great way to get organized for Christmas, the one holiday which invariably leaves me feeling like I got plowed by a mac truck. Thanks for your kind words on my blog (the play kitchen) they really made my day. Thanks for sharing ... I'm always a fan of new organizational ideas. I'm one of those odd people who gave up "Christmas shopping." Not that I don't buy things for people (yes, I'm still materialistic to some extent) I just got to hate the crowds, hustle and bustle of the after Thanksgiving shopping season. So now, I just pick something up if I see something during the year that I think is just perfect for someone. It's gotten especially easy since we've been doing so much traveling ... I'm pretty sure it's something they won't buy for themselves. Then I just have the fun of wrapping while I watch Christmas movies or listen to music. Let's me focus on the important stuff. love it!! I actually have this on my to-do list for this weekend!! cant wait to get it started! Oh my gosh! You and I could be long-lost sisters! I keep one of these! I'm a list maker! In mine, I keep track of recipes that I must make, those that I want to try if time allows and tips and tricks that I've learned to improve them. 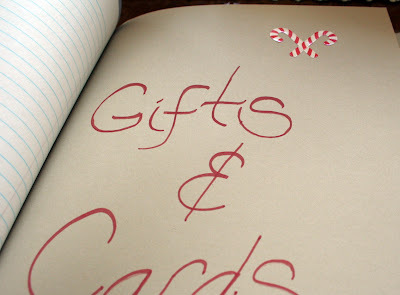 It's so handy and makes the holidays just a teensy bit less stressful! Plus the added benefit is that it's fun to look at all through the year to get in the Christmas spirit! I love this idea! I do a similar thing on the computer--I'm sort of a nut about organizing for Christmas, too. I usually start working on it on the first day of October so I can enjoy December without being too busy or stressed. It's fun to look back through the years and see all of the gifts I've given people in the past. It brings back so many memories. Great tips! I always could use some more holiday organization. I am also a 27 year old mom of 3 that used to live in Colorado until this past March :-) We definitely miss it! Ok, I am so going to try this! Part of my Christmas list for the TWOC is making it all a little less crazy! Thanks for sharing your great idea. I totally do this and blogged about it last year - and got made fun of for it! 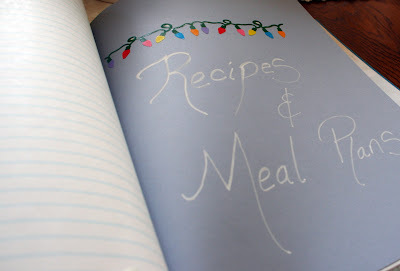 I love that you keep recipes in your binder, I'm going to add that this year! Wow! You are living my dream! I would love, love, love to be able to look back at my lists from 10 years ago! Mine are all scattered in spiral notebooks. The best thing is that in your organization, you are really documenting your family's history. That will be so cool for your kids and grandkids one day! Last year I made my Christmas Organization binder, very similar to what you have done here. So helpful! That is a great idea!! I love Christmas, and I think that's such a simple way to keep track of everything! p.s. Check out my latest post...I have an award waiting for you! what a wonderful idea!!! thanks! What a great idea. I am always so unorganized at Christmas. I may have to set myself up one of these. What a fabulous idea. I live for the holiday season! Girl, will you please come organize my life? You definitely know how to do it! YOur boys are darling and I love their names!!! Especially Titus because it is so unique. All three have Rock Star Names!!! How have I gotten to the lovely age I sport with style and never gotten organized about Christmas??? This is a great idea. Thanks for visiting. I love your Christmas folder. I have one that keeps me organized and ready for Christmas too. Thanks for sharing yours. Love this idea! My mom always keeps a detailed gift notebook that she carries in her purse. This year I WILL DO THIS! Thanks for the inspiration! I love your idea! I should start one of my own so I have everything in one spot. PS I'll take a little Christmas any day of the year! I was just watching HSN the other day when they did a special on decorations. Thank you very much for sharing this! I'll try to do it. Merry Christmas! Happy Thanksgiving! Happy Halloween! What a fabulous way to organize for Christmas! I especially like the idea of being able to look back and see what you gave to people. I love Christmas too! I just wish I would get my behind in gear and shop sooner than I usually do. I would absolutely love it if you would stop by my blog! I'm so excited to see so many other people in looove with Christmas as I am. I was in Target last night looking at Christmas stuff and everyone around me was giving that whole section the side eye and huffin and puffin in my direction. What an amazing thing! I'm so impressed and would love to say I'm going to start my notebook this year, but . . . .
Have a happy, blessed and stress-free holiday season - as you will, I'm sure! Wow, great idea! You are super organized... and you started it at 14??? Crazy... I wasn't remotely organized at 14!!!! Now I know what I've been doing wrong all these years. Can I borrow your folder? That is a great idea. Too bad I'll never do it, I'm too lazy to be organized. I just wing Christmas. Oh, how I wish I was that organized. It would save me so much time! I might have to give that a try. I love it! I'm currently working on a Christmas Organizer to come out next year. I was hoping to do a teleclass on getting ready for the Holidays, but that's when the baby is due. Next year. I love this idea!! I'm going make a Christmas folder tonight, thanks for the inspiration!!! Oh my goodness - I love how organized yet pretty this is!! A great organization tip for the holiday season. That's awesome! Great minds do think alike! Love it!!! Haha Your not the only one that Loves Christmas! I've been making things and working on Christmas projects since the end of September! 4th is memories, 5th is recipes, 6th is crafts & patterns and 7th is kids projects like coloring pages and such! I' keep finding more things I want to add to it lol so it keeps getting bigger! =) But it's been great! Who Gets a Pocket Full of Posies?